So, you’re correctly excited about the forthcoming Episode 7 and you want to rewatch the old films, or get your child/niece/nephew up to speed before they see their first ever SW film in the cinema. However, there’s a problem. Do you watch the films in release order – the original trilogy followed by the prequel trilogy – or do you watch them in George Lucas’ suggested order of one-through-six? 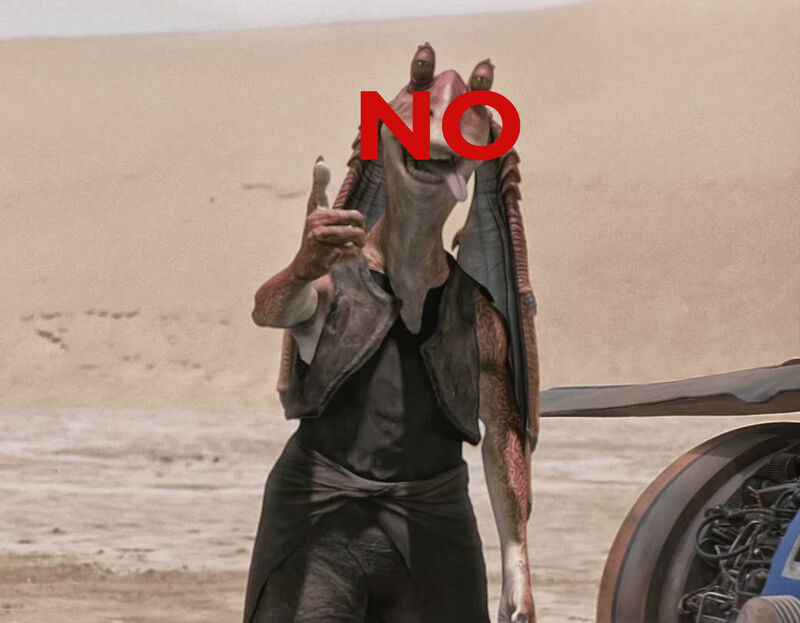 What, so “thumbs up” is a thing in a galaxy far, far away? Or, to put it another way: do you waste seven hours watching rubbish films before or after the good ones? The natural response is to ignore the prequels altogether, but that’s impossible now thanks to George Lucas’ meddling with the Saga that’s currently available: most notably because of the digital replacement of Sebastian Shaw with a glowering Hayden Christensen as the ghost of Anakin Skywalker at the end of Return of the Jedi. However, there is a solution. It was first outlined in 2011 by US fan Rob Hilton, who explained it on his blog Absolutely No Machete Juggling, and it remains the definitive way to watch the Star Wars saga. Machete Order goes like this: A New Hope (episode IV, aka “Star Wars”), The Empire Strikes Back (episode V), Attack of the Clones (episode II), Revenge of the Sith (episode III), Return of the Jedi (episode VI). In other words: the original trilogy with a two-film flashback after Luke discovers the truth about his father, and no Phantom Menace at all. At all. All the stuff you hate is gone. Without The Phantom Menace there’s no more Galactic Senate discussions about taxation of trade routes; no nonsense about the Force coming from midichlorians; less of the cartoonish racism of the various foreign-accented alien species; and no Jake Lloyd as tow-headed, “Yipee!”-shouting child-Anakin, much less the bit about his being a virgin birth. You also lose Darth Maul, admittedly, but he’s little more than an interesting looking prop. Without TPM the worst Star Wars character ever is just part of Amidala’s senatorial staff. You don’t need to know that he had a stupid adventure with Obi-Wan and Anakin any more than you need to know that Obi-Wan had daddy issues with his mentor, that Anakin built C-3PO, or that the Clone Wars were started by a tax dispute. All the bits that actually affect the story are re-established in Episode II. There’s a throwaway line in The Empire Strikes Back where Kenobi says of Anakin “I thought that I could train him as well as Yoda. I was wrong.” But again, without TPM the first thing we see of Obi-Wan is failing to reprimand his apprentice for throwing a tantrum, showing Obi-Wan less as a noble Jedi Knight and more like David Brent in The Office, blithely failing at being either friend or boss. “Wrong” becomes a mighty understatement. You know how there’s a fairly large twist in The Empire Strikes Back that’s somewhat undermined if you’ve just watched three films establishing that Vader is Luke’s father? Machete Order preserves it. By taking a little side-journey before going into the final instalment, we see that badly-trained Jedi become dangerous monsters, and that Yoda was defeated by the Emperor. So when we meet Luke in Vader-shaped silhouette at Jabba’s palace, casually force-choking his guards, it raises the genuine possibility that he’s started down the dark path Yoda warned him about. Similarly, the final battle against the Empire changes from matched space armies led by sorcerers to a scrappy militia of flawed characters versus an established government led by an evil tactical genius with endless resources. That’s a victory definitely worthy of an Ewok dance party. Machete Order, friends: it’s the only sane way to rewatch the Star Wars Saga.